State Auditor Suzanne Bump spoke to the media at her office in the State House regarding issues found with the Department of Children and Families on Thursday. 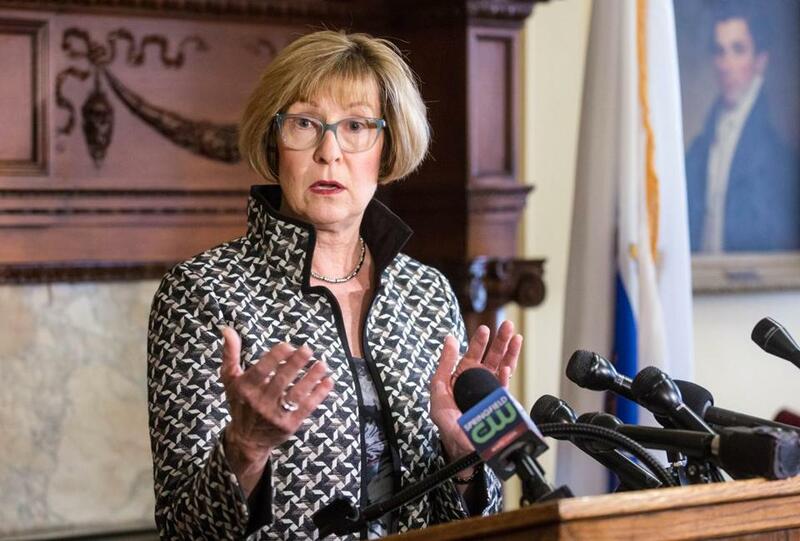 The Department of Children and Families failed to report rapes, abuse, and other alleged crimes committed against children in its care, according to a scathing audit to be released Thursday by state Auditor Suzanne Bump. And in many other cases, social workers didn’t know that children they were monitoring had been badly hurt. “There is reason to conclude that kids are in abusive situations and DCF does not appreciate the magnitude of them because they are unaware of serious injuries that the children may be experiencing,” said Bump at a news conference. “I can’t frankly understand how it is that they can justify their willing ignorance of this information,” she added. In detailed responses to the audit’s findings and in a public statement issued Thursday, DCF officials acknowledged some shortcomings, and said that, since September 2015, they have been “engaged in significant systemwide reforms that are fundamentally changing the way we do our work.” They said the agency has received more than $100 million in additional funding since Governor Charlie Baker took office in 2015 to sharply increase the number of social workers helping families and kids and to create a medical services unit. DCF must keep track of 50,000 children in the DCF system, including thousands who have been removed from their homes to prevent further abuse or neglect. In the last four months of 2015, after the agency’s reform efforts began, auditors found that social workers were unaware of nearly half of the 137 serious incidents involving children in DCF care, including an attempted suicide, physical assaults, and broken bones. The state child welfare agency has been under intense scrutiny since the deaths of several children who were supposed to be monitored, including Jeremiah Oliver, the 5-year-old Fitchburg boy whose body was found on the edge of a highway in Sterling in April 2014, months after he disappeared from his home. His death prompted a shake-up at DCF, which was supposed to monitor the boy’s treatment at the hands of his mother and her boyfriend. Three DCF employees were fired for their negligence, and the DCF commissioner at the time resigned. The agency was also sharply criticized after the death of Bella Bond, the 2-year-old whose remains were found in a trash bag on Deer Island in June 2015. Critics said DCF did not do enough to protect the child from her mother and her boyfriend. In September 2015, Baker vowed to implement new rules to protect children — including a new supervision policy with mandatory steps to review cases and an improved DA referral process. Most of the period studied by Bump’s office predated Baker’s initiative, but the findings make clear the challenge of turning the agency around. In a statement, a Baker spokeswoman said the audit’s information is out of date because of all the reforms, including the hiring of nearly 400 new social workers and managers. “The administration takes very seriously the well-being of children under DCF care and will continue to work closely with the department and other state agencies to ensure the safety of every child,” wrote the spokeswoman, Lizzy Guyton. The audit found that, in 2014 and 2015, DCF officials failed to properly monitor at-risk children at every level, from tracking their health to reporting potential crimes against them. Even when children die, the audit found, DCF officials are slow to complete reports on what led to the deaths. Over the two years, the auditors found that DCF officials were unaware of 42 percent of the serious medical incidents involving a sample of children in DCF care. They did not know, for example, that a 15-year-old suffered brain damage from a firearm injury or that a 1-year-old received first- and second-degree burns on his body, the audit found. The auditors were able to find out about the injuries by cross-checking the children’s names against records at the state MassHealth program, which provides insurance for low-income people. The audit recommended that DCF use the MassHealth data to identify when children are receiving medical care so they can identify situations without needing to rely on others to report the incidents. Not only did DCF staffers fail to report some possible crimes to prosecutors, but auditors saidthey also didn’t report more than 100 cases of sexual abuse involving children in their care to the Office of the Child Advocate, an independent watchdog that oversees DCF. These cases included two male employees of a DCF-contracted residential facility who each sexually abused three girls; a 10-year-old who was raped by his father; a 4-year-old who was sexually abused by her mother; and a 17-year-old who was gang-raped by five assailants. They were not reported, the audit found, because DCF doesn’t consider instances of sexual abuse “critical incidents” that are required to be reported. The agency is also required to promptly turn over to the Office of the Child Advocate the results of any investigation into the death of a child in its care. The audit found that the reports were always turned over late — sometimes more than a year after the child’s death. The auditors said more than 70 children had died in its care in 2014 and 2015.
all child deaths and near deaths. In their formal response to the audit, DCF officials said they would look into the feasibility of accessing MassHealth data to identify medical issues, but felt the information would be out of date by the time they could access it. They said that the reporting process to the Office of the Child Advocate “needs to be simplified and streamlined,” with more reasonable deadlines. DCF officials also said they are working with the child advocate “to determine under what circumstances the sexual abuse allegation should be reported” to the watchdog’s office. Bump said that child welfare officials need to understand that providing complete information about the children in their care is crucial to protecting them. House Speaker Robert A. DeLeo said in a statement that he is “incredibly upset and troubled” by the audit. He said his office has reached out to the Office of the Child Advocate to consider next steps. Andrea Estes can be reached at andrea.estes@globe.com. Laura Krantz can be reached at laura.krantz@globe.com.